As usual, I’ll take a look at the shoe’s, tech, performance, comfort, materials and determine if it’s worth the price. BOUNCE – their newest cushioning system. BOUNCE has mainly been used for adidas’s running shoes. But now when it came to basketball, these sure didn’t fail. It’s originally made to be a cheaper alternative to BOOST, but it feels the opposite here. SprintFrame – Similar to StableFrame, it is a reinforced midsole system to add support and stability. TECHFIT – strong upper material to make it durable and sustain quick, harsh movements properly. This is a must have for Damian Lillard, who often performs harsh movements, quick cuts and step back jumpers. TORSION SYSTEM – plastic arch support, which is basically a bridge between the midfoot and forefoot. It makes the shoe supportive, smoothens out the step transition and helps unlock the full potential of BOUNCE cushioning. Continental Rubber – this is the shoe’s outsole made to provide traction regardless of the floor or weather condition. It’s very durable and this makes the shoe a good outdoor pick. There isn’t much to say. You have a bunch of awesome tech, great materials and a supportive fit. Of course it is going to be comfortable. The inside of the shoe is really soft and blends in with your feet nicely. This version also doesn’t need any break-in time. One thing though, these do fit pretty long, so for optimal fit I’d suggest going half a size down. BOUNCE just works right. Period. It’s not too soft or too firm, it’s well balanced. But you also feel that softness the D Rose 6 offered with BOOST. And that is awesome. You basically get great cushion with impact protection, stability and power with your movements. Simply put, there’s nothing wrong with the cushion here, I think both types of people, the ones who like bouncy cushions and the ones who like firm setups could like these. The pattern is sticky and dense, so gripping the floor won’t be a problem. 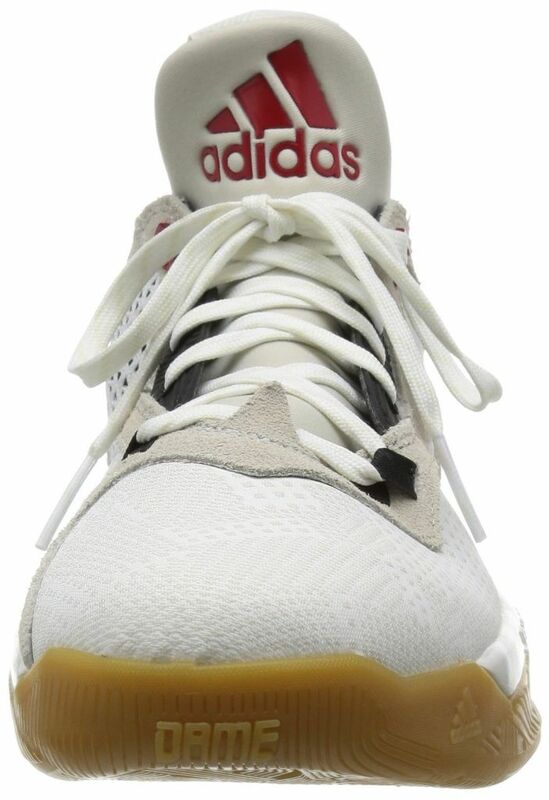 It does collect dust fairly quickly, but most adidas’s shoes do, so you’ll have to live with that I guess. Just know that wiping will be required from time to time. Because of the Continental Rubber outsole, you could take them outdoors too. Probably not the best streetball shoe, but it will definitely hold up for a while. Again, nothing to complain once again. The TECHFIT material itself is extremely well-made and supportive. Combine that with a proper fit, a high-quality lacing system and a TPU heel counter. Very basic, but trusty setup, that holds your foot intact very well. Some people like soft uppers, some – hard/plasticky ones. This time however, some kind of woven is used combined with the TECHFIT technology (you could call it jacquard too). In result, you get a hybrid – it’s soft and comfortable, but also pretty durable and very supportive. That’s crazy and something you rarely see these days. Four different material versions of the D Lillard 2 have released now. This is the TECHFIT or the ‘Jacquard’ version, find out about the other ones HERE. This is not even a question. The shoes cost $105. A hundred and five dollars. For ALL the tech, performance, materials, signature markings offered, the shoe costs $105. It’s unbelievable how unfair today’s market is. QUALITY wins here no doubt. I think adidas truly shows how it should be. A great shoe that’s very affordable and fits most people’s needs. Sometimes Nike and others should follow by example. You rarely get to see something like that from them. They’re comfortable, they have great cushion, traction, support and 4 upper variants to choose from. If you like the design and you’re looking for a basketball shoe, just pick these up. You won’t regret it. So yeah, there’s a reason I always recommend to buy from these stores. Both are 100% trustworthy, so choose which one you like more! Curious to know how it compares to the first D Lillard shoe? Find out here in the review.